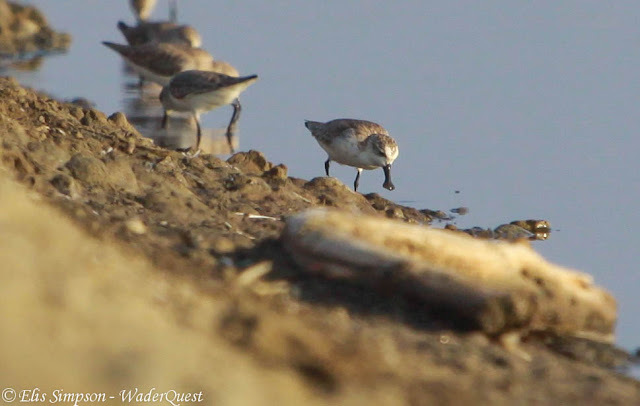 Wader Quest: A departure from my normal composure. A departure from my normal composure. "... farmers like him are not worried about the impact on the birds because leasing the land to the solar farm operator is more profitable than conservation." Well of course it is, conservation is all about saving something simply because it exists, its worth and value are intrinsic and cannot be measured. If money could be made from saving animals and other life forms from extinction then there would be no need for conservation, everyone would be doing it. Instead the sad reality is that money is, as a rule, to be made by destroying the environment. "We don't get anything from the birds. They just come here to catch fish and we don't earn anything from that,” It distresses me that wildlife is only seen and appreciated by the masses for what it can provide for us, as though its only reason for existing is to satisfy some selfish need of ours. If they do not deliver, then they are of no consequence and can be dismissed as irrelevant in our lives or worse still considered expendable. Why must we see everything in terms of what it can do for us rather than what we can do for it after all we're supposed to be the intelligent, superior species here aren't we? I despair of the attitude that the world was put here just for our amusement and gratification, when you consider how infinitesimally insignificant we are in the greater scheme of things we have an opinion of ourselves which vastly exceeds our true worth. Words fail me here. What trumps substantial amounts of cash? Pretty much nothing and certainly not the lives of birds it would seem. I'm sure there are many other suitable sites for a solar farm in that region that would not compromise the environment and threaten the very existence of the migratory birds, but few will perhaps be as cheap to exploit as this farmer. And who stands to profit most from this? Those who least need it. And who will suffer the most? The birds that utterly depend on it. Wouldn't it be educational if we could wave a magic wand and get people with no respect for our beloved birds to live for a year as a migratory wader, especially a Spoon-billed Sandpiper, a bird for which the protagonists in this episode obviously have the utmost contempt? Only in this way could they possibly be made to understand (if indeed they were to survive the whole year) how b***** hard it is for these birds just to get from one day to the next. They would realise then just how incredibly important these few acres of salt ponds are and they might also realise that the majority of waders don't actually eat fish ("they also eat the fish from our ponds"). For a supposedly intelligent species it is amazing how some of us are happy to render ourselves deliberately blind to the world's environmental problems, which ultimately will be our nemesis. If there is a quick profit in it for us we choose not notice what ridiculous harm we are causing to our world and the animals that live within it. Only a people that have an affinity with the natural world who cherish conservation as we do will be able to understand why this upsets me so much. Only they will perceive why this is so blindingly obviously wrong and only they will also be moved by the now familiar words that follow. When the last tree has been cut down, the last fish caught, the last river poisoned, only then will we realise that we can't eat money. Anon. This very sad and unfortunately not a unique attitude. Money poisons everything, even the younger generations. The only hope is buying lands everywhere. Very true, but then it is money again that solves the issue. The only solution to the evil of money is... money! Yes, conservationists need to be beating these people at their own game, making money through forming trading companies that spend their profits on conservation rather than paying shareholders. Of course, some sort of functioning government that paid some sort of attention to the environment and enforced the law would also help but every government I have witnessed in Thailand (all elected governments and military ones) have allowed their cronies to override any environmental laws there may be to profit from habitat destruction, stealing of public land in national parks, illegally placed shrimp farms, the trade in endangered species and over-fishing using slave labour. As we are all starting to realize, buying land and bypassing these numpties is the only way forward. Yes, its all very sad. Money is the new God. Money is the new religion. The way things are going one day (when?) the planet will be a poisoned desert!